The season finale of Site-Specific Performance Series at the Miami Design District happens this Saturday, November 21st at 5:30pm. Instituted by Craig Robins in 2014, the roving series brings performance out of the traditional theater and invites guests to explore the neighborhood via ephemeral original works of dance, music, theatre, art, and poetry, which often engage the permanent public art installations in the neighborhood. The finale event will include four performances featuring artists Paul Tei and Mad Cat Theatre Company, Das SaD, Fernando Calzadilla of Miami Theater Center, and Alma Dance Theater. Please add this amazing event to your weekend must-see calendar! More details after the jump. 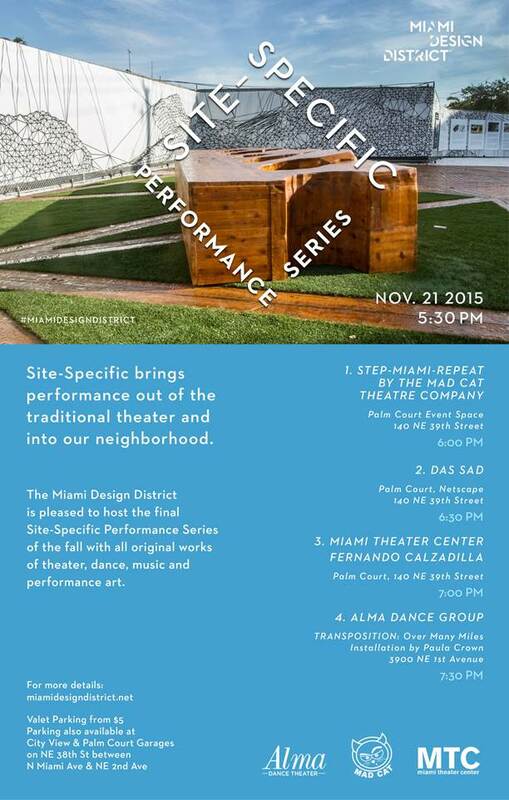 Description: Step Miami Repeat, a performance by Mad Cat Theatre Company, featuring Paul Tei, is an interactive, immersive, human orchestra that celebrates the rhythms and immediate energy of the environment directly around the performance. Your presence in the moment is requested as our symphony progresses, and ultimately disperses in the temporal fashion it began. Join Mad Cat Theatre Company as they drop their anchor in fertile ground. Description: An original electronic music performance at by Das SaD duo Daniel Clapp and Juan Gonzalez at Konstanin Gric’s Netscape installation. The interactive Netscape consists of a six-point star-shaped modular steel frame, from which seats made of fiberglass and polypropylene netting are suspended to form a series of hammock-like swings that rock gently when used by visitors. Description: Fernando Calzadilla is a theater designer, dramaturg, scholar, visual and performance artist with a multi-cultural background that weaves hands-on experience with theory to expand the scope of his art. His interdisciplinary practice comprises performance, theatre, ethnography, visual arts, and communication processes from a Performance Studies perspective. He has a PhD in Performance Studies from New York University. He collaborates on scripts and designs the sets, lighting and costumes for productions at Miami Theater Center. Description: Alma Dance Theater is a conceptual performance company which strives to be an artistic force by creating innovating an emotive dance performance for audience in Miami and abroad. In Transposition Over Many Miles, Alma Dance Theater will physically activate the space of visual artist Paula Crown’s interactive site-specific installation on view in the Miami Design District. Paula Crown: More on Paula Crown’s Transposition Over Many Miles can be found here. Crown has transformed the piece again by bringing 300 pounds of fall leaves to the work.